Pioneers in manufacturing industrial products, we are world renowned for our Oil Burner Couplings. Known for its toughness, durability and reliability, these are made up of very high quality plastic tubes which are used for connecting the motor to the oil pumps. Result of high technology and stringent quality maintained during production, these supreme quality couplings are available for ecoflam, riello, weishaupt, baltur, de unigas, fbr and cuenood. 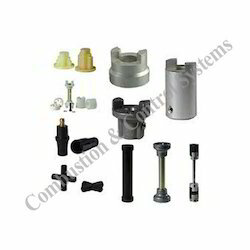 Looking for Oil Pump Coupling ?